This camera pack from Evoc is definitely one of the most-awaited in recent years. 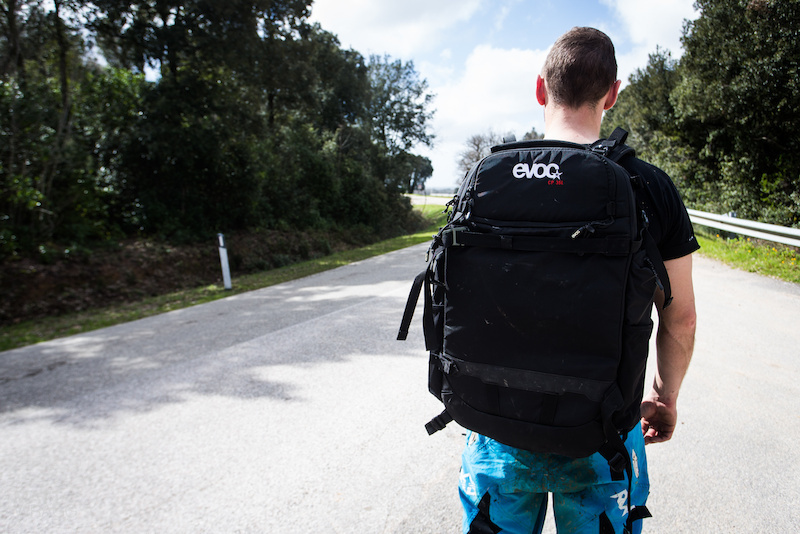 A relatively new player in the backpack market, Evoc have rapidly earned themselves a place among our favourite riding packs here at Pinkbike. They are comfortable, stay in place well and tend to be packed full of useful features and touches. The prospect of this approach scaled up to a photo pack looked like a winning combination. Evoc are clear with their target audience for this pack - it's aimed at professionals. They designed it to carry "a full set of professional equipment." With 35 litres of capacity there is no doubt that unless you are carrying several bodies and a selection of lenses it's going to be too much. Outside it has a selection of straps and mounting points to carry everything from tripods and flash stands, through to a snowboard or ice axes (neither of which are particularly useful for mountain biking, but Evoc also had the winter crowd in mind for this pack). More relevant to mountain biking, a drink bladder can fit into an outside side pocket, the zippers are nice and big so you can open them with gloves on and there is an integrated rain cover at the base of the pack. It opens close to the back, with the zip running in a C-shape from slightly above the bottom with two zippers. In other words, to open this pack, you lay it face down and open the back of the pack. Inside the layout is pretty standard, with a T-shaped layout to fit a camera with a telephoto lens in the centre and a row of positionable dividers down each side. At the top there is a quick-access section that can be reached from the front of the pack, ideal for flashes or a smaller camera and lens. On the inside of the back there are three, flat zipped pockets for storage. At the top of that section there is a fourth zip that lets you access (and probably remove) the back protector that sits next to your spine when you are wearing the pack. How it works as a backpack: As a backpack, this is for sure one of the most comfortable camera packs we have tried. 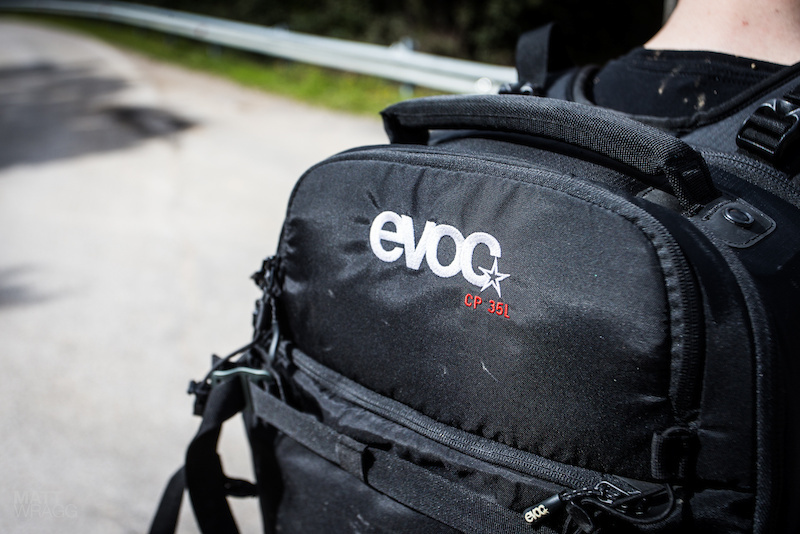 However, like most people we know who use Evoc packs, we did remove the back protector before we used it. They are a nice idea, but a rigid piece of material that close to your back detracts too much from the comfort of the pack. The straps, back padding, fat hip strap and second chest-height cross-strap spread the weight nicely and hold it in place incredibly well. If you are travelling this means you can carry the inevitably heavy loads in as pain-free a manner as possible. Even running around somewhere as hot and sweaty as Hong Kong there was no rubbing or soreness caused by it. On the bike, it means a pack that stays put and doesn't swing about, even if you are going faster than you know you really ought to be with that much equipment on you. 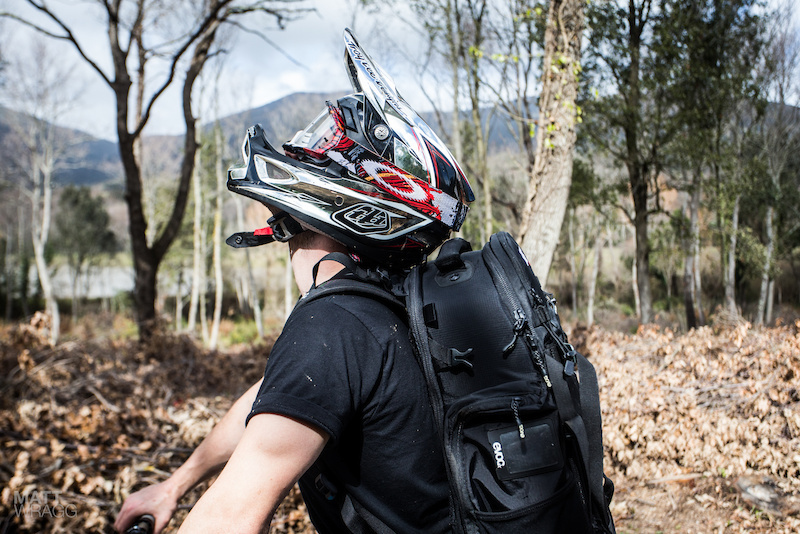 Some of the bigger photo packs have a tendency to ride up and make contact with the back of your helmet, this one doesn't, even on steep technical terrain. As a pack to travel with we were also very, very impressed. It is slightly slimmer than some other big-volume packs, which means there are no hand luggage dramas (so long as they don't ask you how much it weighs, of course). At the front there is a pouch that will happily take a 17" laptop. With a laptop on-board we tended to use the quick-access section of the internal area to carry the power leads so we could set the computer up without needing to faff around opening the main compartment. How it works as a camera pack: This is where the Evoc pack rather fell down for us. Ultimately the thing that lead us to stop using the Evoc pack is the fact that it cannot take a Canon 1D-X. Ok, this is very much in the realm of first world-problems, but it's a pack that is explicitly aimed at professionals. The camera is just too tall for the inner compartment, protruding an inch or so above the maximum level. Your camera gear faces inwards towards you with this pack, so that protrusion digs straight into your spine. Any kind of impact and the 10kg+ in your pack will be hammering that into your vertebrae. Older 1D mk IIIs are fine, which means anything up to the mk IV should fit. We didn't have the chance to test the pack with Nikon bodies. The layout inside was well-sized for a full set of gear. There was plenty of space to take two bodies, four or five lenses, battery charger and have space left for either a laptop charger or flashes. But, what frustrated us with this pack is the layout of the pockets, especially with the way the pack opens. Evoc recommend you keep your cards in one of the mesh pockets in the main compartment. However, the pocket is long and quite flat with no way to order your cards, so if you have several in there it's a recipe for scrabbling round trying to reach the right one. If you choose to keep them in the pocket on the front of the pack you have another problem - when it is open you can't get to that pocket, you need to close the pack and flip it over to get at them. It too has no way of keeping them in order. We ended up opting to keep the cards in the front pocket, as we tend to change cards a lot, but it lead to much irritation, especially at the start of a shoot while we were setting the cameras up as we zipped, flipped and repeated to get the right card in the right camera. Inside the main compartment we were not impressed by the dividers. They attached and held their position fine, but they just seemed to be a little too thin. In the sections with a lens or a body, they were fine, but if you filled a section with smaller parts like filters or lens caps, then when you were in motion they had an annoying habit of moving around inside the pack. *Update from Evoc on the pack (April 12th, 2013) - "One item that came up with the pack is that the Canon 1DX does not fit. The current production models have accounted for this size difference and do fit the Canon 1DX. The packs that are arriving in stores soon will fit the Canon 1DX." Yeah my 1Dx was too much of a squeeze so I just took 500 Go Pros. Don't get me wrong, the fit is brilliant and I hope I got that across strongly enough, but I've gone back to my Lowepro as the layout with card slots, etc is much easier to work with, the dividers are also a lot thicker. If they re-configured the pockets a little, fattened the dividers, moved the zip to the other side of the bag and made it that little bit deeper it would be near-perfect. 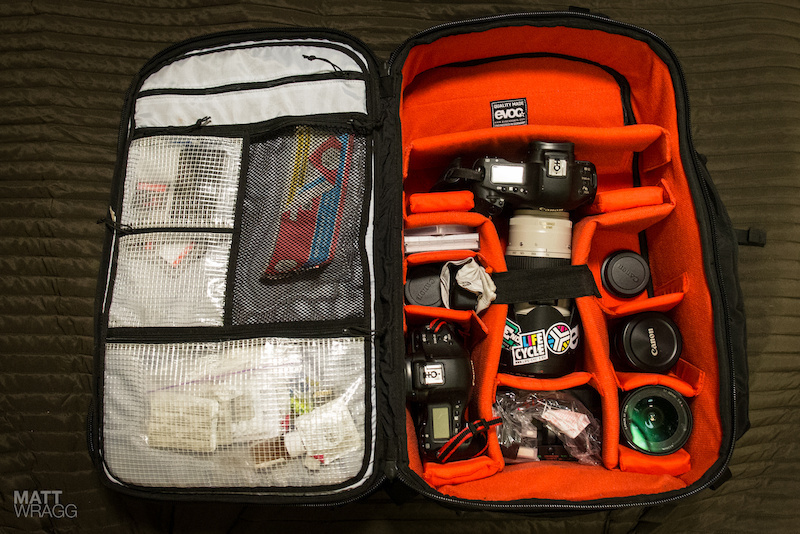 I've own a lowepro backpack for about 5 years now, between cameras, lenses etc. the weight comes up to about 60 pounds. I'm an advertising/editorial fashion photographer so I gotta carry that thing everywhere go (sometimes I get away with having an assistant carry it), each year it becomes heavier and I'm only 30, can't imagine biking with it, you guys are my heroes! I'm going traveling this July for a few years, this might just be the one to carry my laptop, camera/lenses and hard drives. I'm a graphic designer and plan to work for existing clients as and when I get a net connection. I'm also taking a bike and a duffel full of kit, so I'm trying to keep luggage to a minimum. Do you think this bag would work as an adaptable all round pack? Life must be so hard if you have a 1Dx... Btw, the equipment is immense. I agree with Apostt, but i also would say he may not have a bike in which costs the equivalent to his camera. His talents obviously are focused on photos vs those who get an expensive bike, but don't use its 100% capacity to perform. $400 it is a bit too much isn't it?? There are cheaper and better alternatives. For a bag this size and build id say its pretty standard pricing, Fstop, Tamracs, Think Tank, Kata etc, are all in the same price range and there is alot that cost more, but there is also alot that are less that offer more or less features... At least its one of the least "Camera" looking or "Im about to climb Everest" looking large bags out there. I wish there was a smaller version that can carry just a DSLR and couple of lenses. 35L seems like alot, especially for photographers who ride with the backpack on aswell. Look at the lowepro photosport. brookeside, try the camera block, i've both the photopack and a evoc freeride 20l withe che camera block, it's perfect to carry a normal setup! I dont know this backpack, but by a company of outdoor sports articles I would expect some special detail like the hydra pack compartment and certainly compared to many other brands does not have many differences, in addition the price is a bit high I think... I use Manfrotto slipcase for 1D camera, 70-200, 10-20 lens and two flashes all kept in my 2008 CamelBack 20L! I also have 1.5 liters of water... and a 33cl can of beer!!! I love my Timbuck 2 camera backpack. It fits my 60D, 300mm telephoto, 125mm wide angle and battery grip perfectly. Has a spot for the tripod to attach on the outside and a separate compartment for things like my rain shell, lunch and a few beers. Its water resistant with a waterproof cover included. I love it. My only grip is that I wish it had a larger, padded hip belt like the evoc has, but for how great it is, Ill overlook that issue. 125mm wide angle? Are you shooting 8x10? Try the Dakine Quest. Fits my 5d3 with 70-200 2.8 attached tightly. Room for more lenses, accessories and a rain jacket. I was looking forward to reading a test of this backpack, but now I'm quite happy that I got the F-stop Tilopa instead. Best camerapack I've had for riding and skiing. Yep, f-stop Guru/Loka/Tilopa are perfect for those sports. And customizable for pro/ semipro bodies too. Agreed. I've been using my Tilopa BC for the past two years and love it. I have this bag and it's by far my favourite camera pack, having tried every Dakine bag and a few others. "we did remove the back protector before we used it. They are a nice idea, but a rigid piece of material that close to your back detracts too much from the comfort of the pack"...if you didn't use it, how do you know? I would think this might be one reason why you noticed the 1D sticking into your back. Anyone with a bigger camera (RED, 1Dx etc) is going to deal with this problem. If you fixed it by making the bag deeper, but keeping the volume at 35L, the bag would have to have some annoying dimensions and you couldn't use it as a carry-on for planes (it's on the edge as-is). IMHO the back protector solves this "problem" and keeps the back rigid and stable if you have heavy weight on one side such as a tripod. maybe worth a shot, before you go back to a loose program bag. my two cents. I've been using this bag since December with a RED Epic as well as the RED Scarlet and I have to say that it is 10x better than any Dakine bag I've used (the new and old Reload, Sequence & Mission). It fits way more gear than any of those bags (I pack 5 lenses,4 Red Brick batteries, lunch, ski skins, avalanche shovel & probe and sometimes even a 7D as well. Not only does it fit more but it doesn't feel as heavy since the quality of the backpack is so good and I prefer to do a bit of squishing with my gear than to have a bag that has a ton of swing weight making it too hard to ski or bike. Also the tripod carry system is one of the best I've had on a bag. If you need a good backpack for minimal photo equipment, check out Clik Elite's Compact Pro bag. It carries my Canon EOS 10D, an extra lense, a few filters and even my GoPro. It still has room for other gear up top and a water bladder. Super happy with my bag and it only costed me $105 USD. I'll do a review of it (with photos) and hopefully get it posted on MuddBunnies.com next week some time. We've been using this bag for the last 4 months or so and it is a really great fitting bag. It's a big bag, no doubt about that, but the large waist strap make it relatively comfortable to ride with. when you look at the value of the gear its carrying.....hardly. it doesn't matter. still it's only the backpack. 1DX issue, flip the inserts and place the body the other way up, viewfinder down at the bottom of the pack. The pack is slightly deeper at the bottom. I have changed my camera bag thinking of what is happening when one of the main zippers is failing and the bag is opening, maybe in the middle of riding down in the middle of the roots ... I do not see from this pictures but it doesn't seems to have some backup stripes or something that prevent this. For a bag that is under constant vibrations, dust etc. and should carry expensive toys this issue should be considered. It's a great Camera Pack indeed. But for me the Dakine Sequence is still the ideal Pack, solid on descents and way more affordable. Got mine for 100 bucks a year ago, still happy with it. To everyone complaining about the price, it isn't that unreasonable, i mean, surely you get that camera included? right? Helmet touching top of bag on an EVOC mean bad sizing. For small camera backpack I truly love my lowepro minimus. Too bad it was discontinued fast (with the primus also), as for me they were the best combo camera/backpack lowepro ever made. HOW MUCH??? PEOPLE PAY THAT FOR A BAG???? 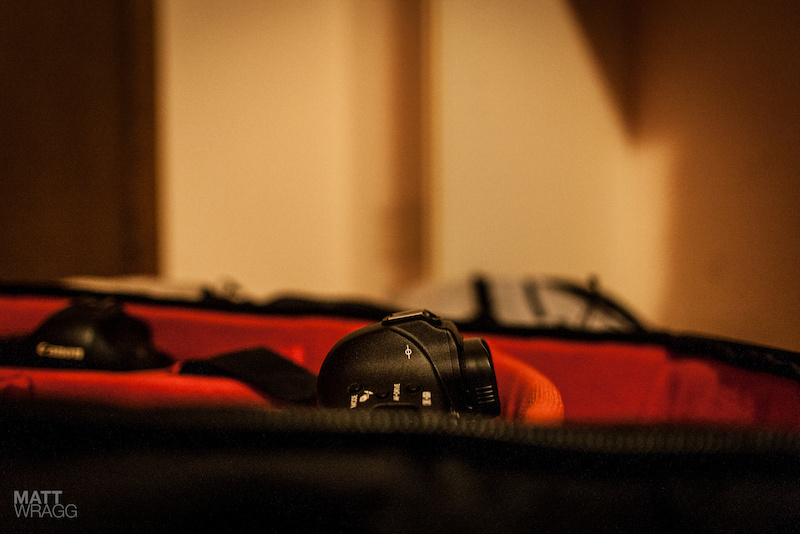 I am selling mine due to I went with a micro 4/3 system and the bag is far to big for my gear now. PM me if anyone would like to take it off my hands for a good deal. Such an improvement over my old sequence. The T-straps on the zippers are worth it alone. Very great fitting pack. I'm only on 1d3, so the height isn't an issue for me. I use the 5D MKIII with the grip, so I'm assuming it's practically the same height as the 1Dx ? Do I still need this if I do not have a camera? of course...I sold my camera so I could buy one of these lovely bags. no 1dx in it,not in camo and just not as well designed/thought out as a Lowepro pro-trekker , nice try evo.back to the drawing board. So it would fit a 5d mk3 in it?? I spent all my money on my bike. I can't afford the 1dx at $6800. Good review, wish all mountain bike journalism was up to scratch like this. $389 USD? Evoc available in the states now?